When ms Koningsdam sets sail on its Premier Voyage April 8, 2016, the vessel will debut several innovative concepts and new public venues, while still featuring popular amenities guests associate with Holland America Line. Guests will have the opportunity to enjoy fine dining in several alternative restaurants, including Sel de Mer, a new French seafood brasserie; a re-designed casual Lido Market with themed serving stations; a stunning main dining room; and favorites such as Pinnacle Grill, Canaletto Italian restaurant and pan-Asian Tamarind. A new immersive farm-to-table dinner experience in the Culinary Arts Center, presented by Food & Wine magazine, is a groundbreaking concept allowing guests to discover their inner sous chef or explore fresh, regional ideas in food and entertaining. Join in with hands-on cooking classes and demonstrations, shake it up with signature cocktail classes, and attend special classes in flower arranging, plate presentation and cake decorating. Younger guests are warmly welcomed on board with Club HAL, providing a wide variety of exciting youth and teen-friendly activities for guests aged 3 to 17, supervised by full-time staff with degrees in education, recreation, childhood development or related fields. Kids aged 3-7: Younger cruisers can enjoy activities such as pirate treasure hunts, ice cream parties, storytelling and "Little Artists" crafts. 'Tweens aged 8-12 can take part in video game tournaments, relay races, karaoke dance parties and more. Teens aged 13-17 have their own places to hang out in The Loft for late-night sporting competitions, dance classes, and teens-only nightclub events. 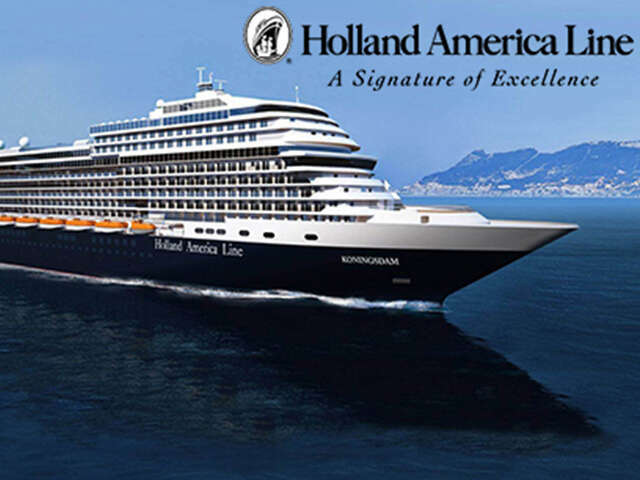 The ship also will feature Holland America Line’s first purpose-built staterooms for families as well as single staterooms among its 1,331 guest accommodations. The energetic Music Walk area featuring all genres of music showcased in venues including Lincoln Center Stage performing chamber music nightly; Billboard Onboard, where live musicians rock the crowd with chart-topping hits; and the popular B.B. King’s Blues Club in the Queen’s Lounge bringing the best of Memphis music to sea. World Stage brings 270-degree LED projection to the main showroom, enabling new concepts for showtime performances and immersing the audience in a panorama of sight and sound. Following its inaugural Europe season in 2016, ms Koningsdam will homeport at Port Everglades in Fort Lauderdale, Florida. The ship will sail a series of Caribbean voyages and one cruise to the Bahamas from November 2016 through March 2017. Koningsdam's Caribbean itineraries will be available for booking in late spring of 2015. Contact us today to find out how you can be one of the first passengers to experience this incredible new ship!